Bathrooms can create dangerous situations for the elderly or seniors and people with mobility problems. Injuries can occur when using traditional bathtubs because people could slip and fall as they enter and exit the tubs. Having a walk-in bathtub in place is a great idea if you want to minimize the risks associated with traditional bathtubs. Walk-in bathtubs have doors that close and open and allow seniors and disabled people with mobility issues to use the bathroom safely and easily. These special mobility aids allow bathroom users to safely enter and get out of the bathtub without posing risks of injuries. Walk-In Bathtubs: How do they Work? Walk-in bathtubs have one door opening and closing on its front though sometimes, it could open and close in the bathtub’s side. You need to enter the bathtub and close the door before you can turn on water. The door allows the user to safely enter a bathtub without needing to lift their legs. The doors of the walk-in bathtubs have a sealing that keeps water in the tub making sure it doesn’t flood the floor. To use a tub transfer bench, you will need a qualified person to install it, however, there are also portable designs of walk-in bathtubs. Seniors and disabled individuals who have mobility problems can benefit in different ways when they use walk-in bathtubs. It is easy and safer for disabled and seniors to not only enter and get out of the bathtub but also bathe. The walk-in bathtubs are designed to drain fast so that users don’t have to remain in the bathing area for long. Because walk-in bathtubs don’t have sliding shower doors that pose risks of injury to disabled persons and seniors that brings an added safety feature. Walk-in tubs have design features, which prevent slip and fall injuries often associated in traditional bathrooms. 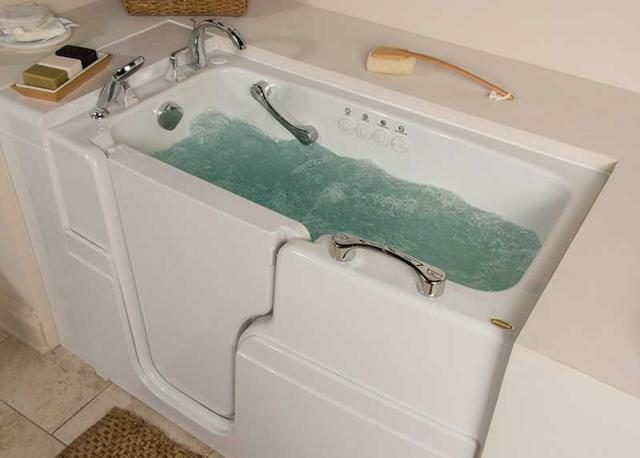 Installing these special tubs helps users to have comfort and minimize chances of being injured when using bathtubs. A bathtub bench offers a kind of bath seat wide enough to spread over or to a bathtub wall. It gives users a surface they can rest on while bathing. A bathtub bench also makes entering in and coming out of a tub easier and faster. It creates a bridge between outside and inside of a tub allowing an individual to sit down on the bathtub seat while still standing outside of the bathtub. This way, a person doesn’t have to step over the wall of the bathtub. Once a person safely seats, they raise a leg at a time before they slide themselves across to the bench top. Another alternative for safe bathing is a bath chair lift. This is a preferred choice if you like soaking in a bathtub. The bath chair lift has a motor and button to help you get down into the water to soak yourself or raise back up when you are done with bathing. You may also consider slide-in style bathtub that works similar to walk-in bathtubs. This kind of bathtub has high walls and a door fixed in the sidewall and a molded seat inside. When the slide-in door opens, it exposes one side of the bathtub seat making it easy for you to back up and sit on the bath seat’s side area.